Bamboozle Village is a secret level in the game Wario Land: Shake It! It can be explored by finding a secret map in Slipshod Slopes. 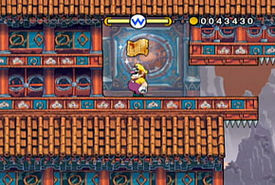 It is another Asian-themed level like Mount Bighill. However, the bamboo stalks are purple and the sky and river are colored red. The mountain formations in the background are colored purple too. Common enemies in this level include Peek-a-booms and Boomdineros. Peek-a-booms are especially useful because their bombs can destroy metal walls and platforms. Wooden posts also reappear and Wario would need to use a Dash Attack on them to move them out of the way. However, some of the wooden poles have spikes attached to them, which can damage Wario. Springs also return which allow Wario to reach higher areas. The 'Golden Enemy' here is a golden Bandinero. Once Wario finds the caged Merfle, he'll have to run back to the start of the level before time runs out. It is possible to complete all treasures and missions in a single try.